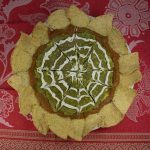 Using prepared salsa, this tasty Halloween marijuana recipe goes together fast but still makes a stunning visual presentation on a medicated Halloween party buffet. You will need a squeeze bottle to make the spider web design. This recipe uses marijuana oil to infuse the dip with marijuana. You can use corn, olive, or vegetable oils.If you want a stronger dose, serve with our “Baked” Tortilla Chips, otherwise use regular tortilla chips. Mix beans, cannabis oil, salsa, and salt and pepper together until well combined and smooth. Spread bean dip in an even layer over the bottom of a large round plate. Mash the avocado together with the remaining tablespoon of cannabis oil, the remaining 1/2 cup salsa, and salt and pepper until well mixed and relatively smooth. 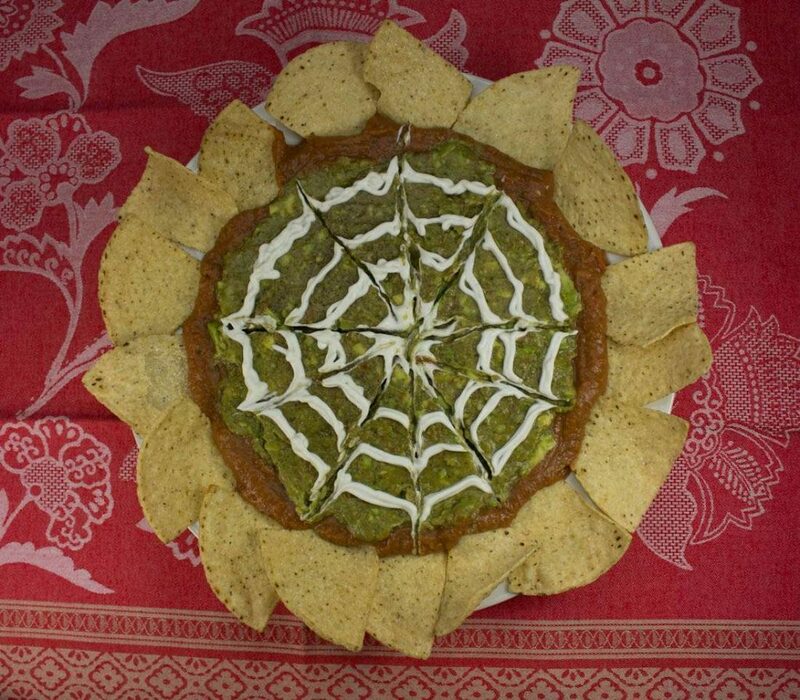 Spread the guacamole over the bean dip, leaving about a 1/2-inch border all around. Mix the sour cream and lemon juice together and put mixture into a squeeze bottle. Squeeze out a large dot of sour cream on the center of the plate. Squeeze out concentric rings of sour cream out towards the edges as shown in photos – don’t worry about anything being too precise. Use a wooden skewer or toothpick to create the web design by starting at the center and lightly dragging the pick through the dip towards the edge of the plate. Repeat around the plate 6 or 8 times. Serve chilled with tortilla chips. 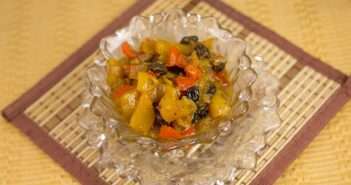 This recipe is by Cheri Sicard, for more of Cheri’s great marijuana recipes, check out The Cannabis Gourmet Cookbook by Cheri Sicard (2012, Z-Dog Media, ISBN: 978-0-9839888-0-9).